Children, representing children worldwide who are infected or affected by AIDS; advertisement by the World Health Organization (WHO). Colour lithograph, 1994. [Switzerland] : [World Health Organization], 1994. Children and AIDS. Children are both infected and affected - a double tragedy. As of January 1994, 1 million children worldwide were infected. If HIV continues to spread ... By the year 2000, 10 million children will be orphaned as their parents will die of AIDS. 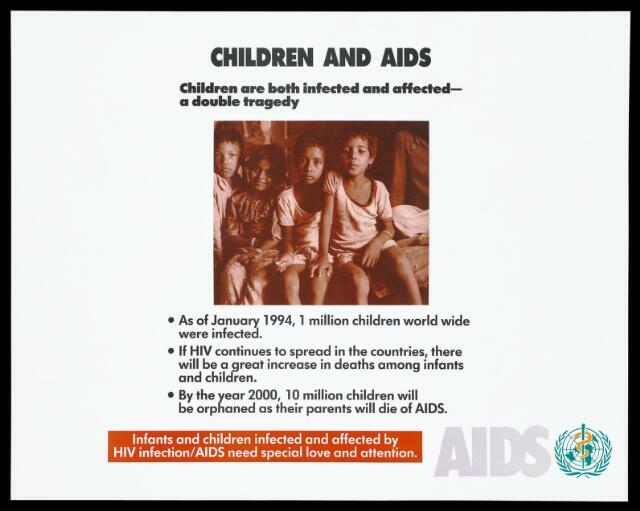 Infants and children infected and affected by HIV infection/AIDS need special love and attention. AIDS.